Did The Star Ever Appear? In a fascinating book entitled, The Witness of the Stars, author E.W. Bullinger traces the stars of the Zodiac from ancient history, long before Greek mythology corrupted their meaning. The word ‘Zodiac’ actually comes from a Hebrew root meaning a way or path. Modern reliance on the Zodiac for guidance is idolatry and forbidden in Scripture (Deut. 4:19). But is astrology a corruption of the testimony about Christ? Bullinger says it is. To show where the circle of the Zodiac was to begin, the Sphinx of Egypt was built as a permanent bookmark. It has a head of a woman, depicting Virgo, and the body of a Lion, depicting Leo. Virgo speaks of the virgin birth of Christ and Leo of His ultimate reign as King of the earth. 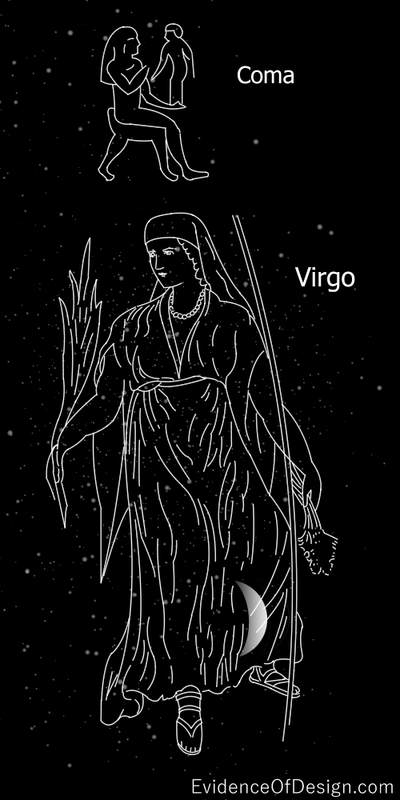 Virgo was pictured with a branch in her right hand, and stalks of grain in her left. The word ‘Branch’ is used prophetically of Christ, speaking of His four aspects as King (Jer. 23:5), servant (Zech. 3:8), man (Zech. 6:12), and God (Isaiah 4:2), the same four focuses of the four Gospels. The grain harks back to Genesis 3:15: “And I will put enmity between thee (Satan) and the woman, and between thy seed and her seed”, speaking of the conflict with Satan and his ultimate defeat at the cross. The first constellation in Virgo explains that this coming ‘Branch’ would be a child, the “Desired One.” The ancient name for this star is Coma and means ‘longed for, desired.’ (see Psalm 63:1) Haggai predicts the coming of Christ thus: “The desire of all nations shall come.” (2:7) The Persian name denotes a pure virgin, sitting on a throne, nourishing an infant boy, whose name in Hebrew is IHESU and in Greek CHRISTOS. Tradition said that when this “Desire of all nations” was born, a bright star would appear in the woman’s arms. Three hundred years ago Thomas Hyde wrote that Zoroaster was a pupil of Daniel and predicted a new star would appear, signaling the arrival of the child they were to adore. When the wise men saw that star, they took the long, dangerous journey to worship the fulfillment of the ancient prophecy (Matt. 2:10). They claimed, “We have seen HIS star (while) in the east and are come to worship Him.” (Matt. 2:2) This child is both the divine Branch, and the human seed (Is. 9:6). He is the God-man, Jesus Christ. As such He both could and did die for the sins of the world to provide eternal life for all who trust in Him.